Nothing would make you more interested in the Baltimore riots than being passionate about race relations in the United States. However, a close second would be owning real-estate downtown. A friend of mine has owned a Baltimore condo since the real-estate crash of 2007-08 and has been renting it out, unable to sell it because he is underwater. Here is how close his, less than ideal, investment property was to riot related events (red circle is a 2 mile radius). It seems that his condo was actually in one of the few places not directly impacted by the riots! A few more observations of interest can be made from the data. For example the protester control (lines of police clashing with locals) was actually quite isolated. However, the organized protesters demanded the lions share of the news coverage. 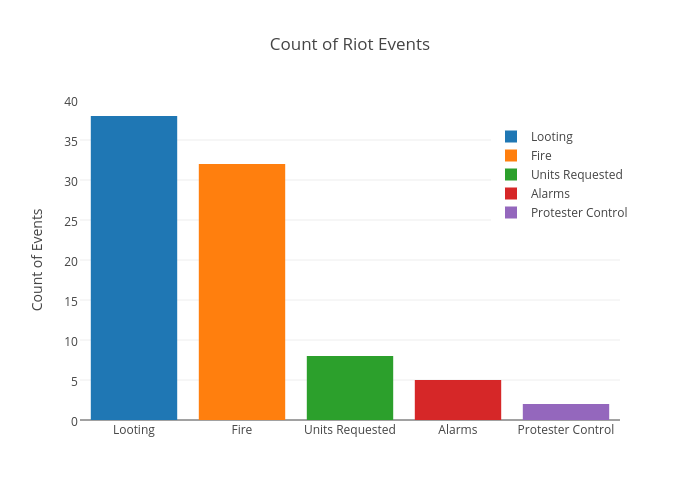 See the chart below for counts of riot event types. Another interesting point is that there seems to be a 'line in the sand' for when lighting things on fire mostly ended and looting/other behavior began. I have drawn a line that moves from downtown, north Highway 129 and then northwest Highway 26. South of this route and west of MLK Blvd isolates an area where 21 of 32 fires took place and nothing else was reported. 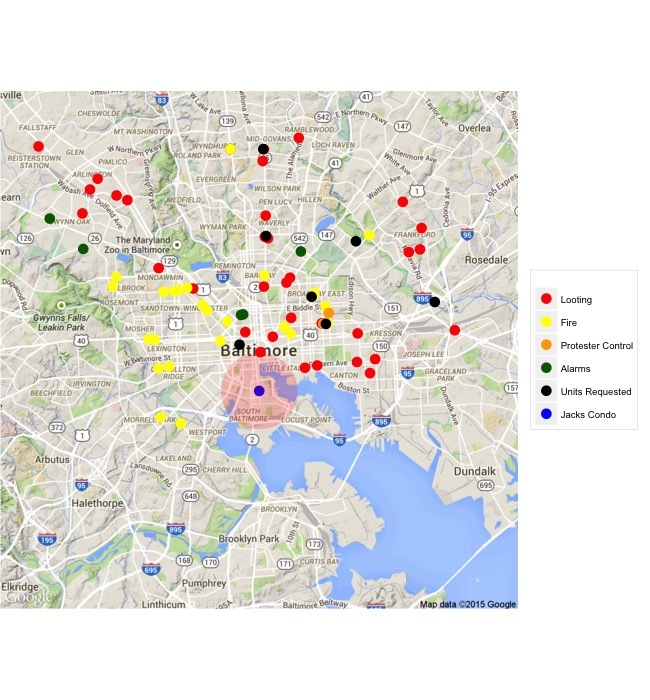 Perhaps someone who has experience living in Baltimore would know why this would be the case. In all it is good to see the violence subside and give way to a, much needed, legal and social conversation.